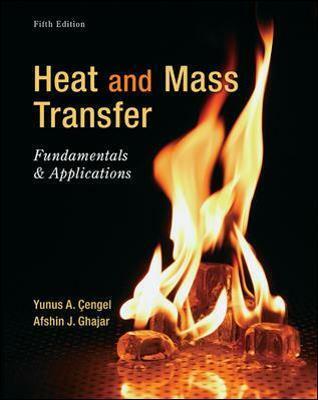 With complete coverage of the basic principles of heat transfer and a broad range of applications in a flexible format, Heat and Mass Transfer: Fundamentals and Applications, by Yunus Cengel and Afshin Ghajar provides the perfect blend of fundamentals and applications. The text provides a highly intuitive and practical understanding of the material by emphasizing the physics and the underlying physical phenomena involved. This text covers the standard topics of heat transfer with an emphasis on physics and real-world every day applications, while de-emphasizing mathematical aspects. This approach is designed to take advantage of students' intuition, making the learning process easier and more engaging. Afshin J. Ghajar is Regents Professor and Director of Graduate Studies in the School of Mechanical and Aerospace Engineering at Oklahoma State University, Stillwater, Oklahoma, USA and a Honorary Professor of Xi'an Jiaotong University, Xi'an, China. He received his B.S., M.S., and Ph.D. all in Mechanical Engineering from Oklahoma State University. His expertise is in experimental and computational heat transfer and fluid mechanics. Dr. Ghajar has made significant contributions to the field of thermal sciences through his experimental, empirical, and numerical works in heat transfer and stratification in sensible heat storage systems, heat transfer to non-Newtonian fluids, heat transfer in the transition region, and non-boiling heat transfer in two-phase flow. His current research is in two-phase flow heat transfer, thermal management of mini and micro systems, and mixed convective heat transfer and pressure drop in the transition region.Dr. Ghajar has been a Summer Research Fellow at Wright Patterson AFB (Dayton, Ohio) and Dow Chemical Company (Freeport, Texas). He and his co-workers have published over 150 reviewed research papers. He has delivered numerous keynote and invited lectures at major technical conferences and institutions. He has received several outstanding teaching, research, advising, and service awards from College of Engineering at Oklahoma State University. Dr. Ghajar is a Fellow of the American Society of Mechanical Engineers (ASME), Heat Transfer Series Editor for CRC Press/Taylor & Francis and Editor-in-Chief of Heat Transfer Engineering, an international journal aimed at practicing engineers and specialists in heat transfer published by Taylor and Francis.